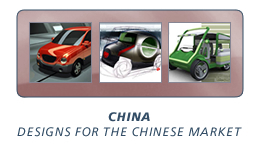 Recognizing that the Chinese automotive market was becoming increasingly significant, the 2004 Michelin Challenge Design theme encouraged designers to create vehicle proposals designed for the specific needs of the Chinese market.The jury selected 11 scale models and 27 2D renderings for the Michelin Challenge Design 2005 North American International Auto Show display. Michelin proved to be the first to display a Chinese-made vehicle at the NAIAS, with the PATAC Kunpeng CAV, which was displayed alongside the I.D.E.A Institute’s Jiexun. Design Team: Lu Jie/Year 99 Industry Design Dept., Tongji Univ.